drinks because beer sales are a substantial part of customers request. Draft beer drinkers are typically aware of how their drink is poured because it affects the total draft beer drinking experience. If you like draft beer, pay attention to the presentation and how the bartender pours it. 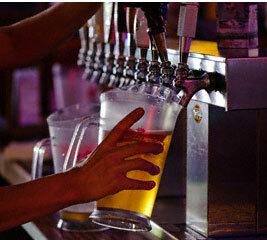 To the uneducated eye, pouring a draft beer appears simple. Place a glass or pitcher up to the tap and pull the handle. Although it appears simple, these are a few things be aware of. When a glass hasn’t been cleaned properly leftover residue can leave an off-taste and ruin the beer drinkers experience. A dirty glass not only can affect the taste but also affects the carbonation. When pouring a beer, from the tap, bottle or can, hold the glass at an 45 degree angle. When pouring from a the tap, pull the tap quickly and fully and allow the beer to flow freely. The beer will hit the middle of the glass and this method will allow the beer to flow down to the bottom of the glass. This method guarantees the proper head. When the glass is 2/3 full of beer, straighten the glass out and hold it upright. Some beers require more time for the perfect pour. Guinness is an example. Guinness experts suggest using the two-part pour or double-pour method for this thick and nitrogenous stout. Pour the beer about 2/3 of the way up the glass and wait 30 seconds. this helps the nitrogen bubbles in the beer settle. American Bartending School’s bartending class teaches these important points on beer. Keep these things in mind the next time you want a great tasting draft beer. If you’re interested in what’s happening in the bar industry, check out creative bartending. what is the name of the stick to take the head of a glass of draught beer?